The Olympic Motorized Treadmill is a basic home treadmill that is ideal for newcomers to fitness. Manufactured by Olympic 2000, this treadmill is not aimed at the fitness freak or serious runner, but rather at someone who is looking to improve their aerobic fitness in the comfort of their own home. 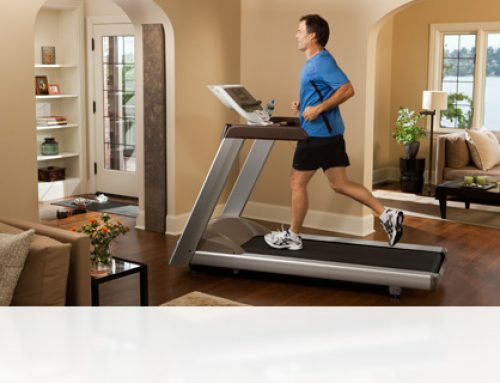 Designed to take up as little space as possible, this treadmill can be stored in any home for use when necessary. It weighs just 21 kilograms, meaning that just about anyone is able to fold it up and move it around the home. In terms of its technical specifications, this treadmill has a bigger running surface than most other treadmills in this price range. The surface measures 100cm x 34cm, giving anyone who uses it plenty of space. No one wants to feel cramped when they are running, after all. The maximum user weight that the treadmill can take is 100 kilograms. That will be fine for most users, but anyone who is over that weight should find a more robust model. 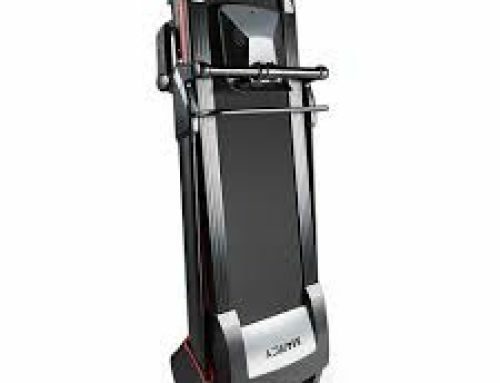 This is a not a treadmill that power athletes, such as rugby players, would want to be using, as it it not designed to take constant pounding from heavy people. The main selling point of this treadmill is its light weight and small size when folded away. This makes it a superb choice for anyone who would prefer to do their fitness work at home, but has limited space. It has two wheels which make it very portable and easy to move too. Weighing just 21 kilograms, you could even take this treadmill on holiday, it is so easy to move. It folds away and takes up very little storage space too. The set-up size of the treadmill is 125cm x 60cm x 123cm, meaning that it takes up very little space when assembled and in use. Most users report that assembling the unit took between half an hour and an hour, so you do not need to waste a whole day or more battling with instructions and confusing components when it comes to putting this treadmill together. The maximum speed that you can reach while using the treadmill is 9.9 km/h. That will seem slow to many experienced runners, but it will suit beginners and older users perfectly. The treadmill is clearly aimed at people who jog for general fitness, rather than those who are looking to complement their outdoor training with an indoor option. There are not many, if any, other treadmills in this price range where you can go mucg faster than 10km/h. If you do want to reach speeds greater than that, you need to be prepared to pay more. There are plenty of great features on the treadmill, though, which will allow you to take a more scientific approach to your training. There is an onboard digital computer monitor which allows you to keep track of four key performance indicators. These are your speed, distance, time and the calories that you have burned. This means that you can keep track of your progress more easily, and is another positive feature of treadmill. If you feel you are going too fast at any stage, there is an emergency stop button to bring matters to a halt quickly. This is an important safety feature. Another important feature which helps with safe use of the machine is the handlebars. These mean that athletes with less strength and balance can support themselves more easily, and feel more secure while using the treadmill. Another useful fitting on the machine is the double drink holder. After all, staying hydrated is an important part of exercise. These drinks holders can also double as phone holders, so you can stay in touch with the world while training, or use your fitness apps. You can also make use of three pre-set fitness programmes on the machine. These offer some variety of work-out types, and are aimed at improving different areas of your aerobic fitness. These provide sufficient variety for most users. 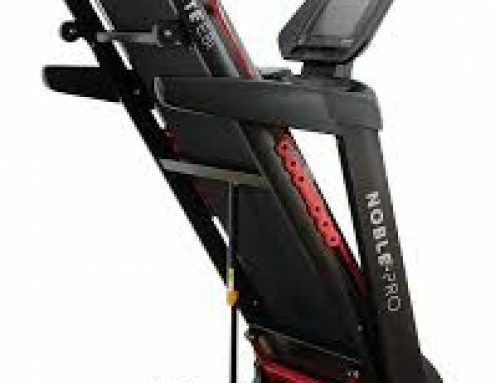 Overall, the Olympic Motorized Folding Treadmill is great value. For someone who knows that they need to become more active, this is a great option to get started on improving your fitness. Easily stored and lightweight, this is an ideal treadmill for older users, particularly those with not much spare space in their home. 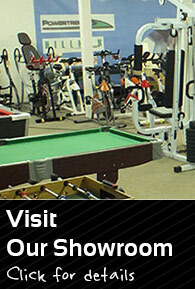 It offers great value for anyone looking to boost their activity levels and improve their aerobic fitness. More experienced runners and fitness enthusiasts would find it a little basic, and should probably look for a more advanced treadmill, though. This is a great treadmill for anyone who wants to make sure that they hit their step count each day, without having to venture into the cold and wet.